Our daughter, Emily, is studying photography at a very prestigious (another word for expensive) art school in Georgia. She is doing wonderfully well there, and, a few nights ago, sent me a few samples of her recent work. One of those samples is a really gorgeous photo of the moon, as seen from her location in Savannah. 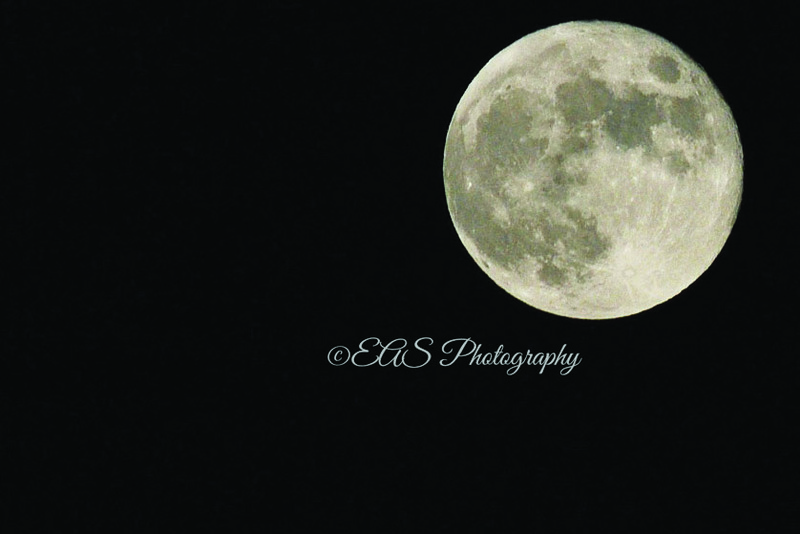 One reason Em emailed that picture up to me is because she knows how much I love the moon. Yes, I love the moon. I can’t fully explain why, I just do. One reason is, undoubtedly, because of my ongoing fascination with our country’s seemingly-ancient human exploration of that place. I remember the Apollo program very well, and often wonder at the present condition of those artifacts of mankind, those remnants of what seems to have been a bolder time for our country, as they still sit on that silent landscape. With that, I have also always been intrigued with that orb’s “stark beauty,” as Neil Armstrong described it, even as he stood there, forming footprints that are still there, perfectly preserved, in that powder-gray dust. (Those astronauts were, and are, the definition of the word brave.) That place, that world which orbits ours, is nearly black and white; at least it is, as seen from earth. Emily’s picture of it was not taken in black and white, but that is what it is, beautifully displaying those vivid but mottled grays on a truly endless sea of black. The moon, today, and for all of the past ages of mankind, has been an object of wonder, and of romance. It has been pondered and written about by modern man, and by the ancients. The eyes of Moses undoubtedly gazed upon it as he led the Israelites in the wilderness, as did those of the constructors of the pyramids of Giza, and those of the earliest cave-dwellers. Just the sight of that beautiful place, shining its soft light down on the people of our world, has convinced countless love-struck couples to share their lives together, and poets, playwrights, and composers to new heights, in their respective crafts. The very phases of the moon arouse our oceans to produce their tides, and, some feel, to influence moods, medical conditions and even the rhythms of life. The old idea of the full moon affecting attitudes has recently been proven. And now, consider these fascinating facts. Fact number 1: A lunar month, the time it takes the moon to circle the earth once, is exactly 27 days, seven hours and 43 minutes. Fact number 2: The average human menstrual cycle is 28 days. The difference between those two cycles, at most, is only 16 hours and 17 minutes… per month, if I did the math right. To me, it seems that that old, romantic moon may have had some part in deciding who we are, and now, even which ones of us ‘are.’ Another fact, perhaps unrelated, but still interesting, is this. Ocean waves, caused by winds, which are caused by the lunar tides, arrive on shore exactly 26 times per minute, no matter which ocean it is, and regardless of the weather. The number is 26, not 28, but it’s still pretty cool. Finally, if you haven’t had enough of my lunar love story already, I think that the moon is a wonderful companion of the earth, and a uniting force for her people. It is something that, regardless of who or where we are, has the power to bring us all together. The moon that Emily photographed from Savannah earlier in the week is the same one I will see if I look to the Vermont heavens, tonight. She and I can even view it together, whenever the weather permits. And we can see it, seemingly, side by side, as the relative distance which separates us is slight, being only about one half of one percent of the distance the moonlight traveled from Mr. Armstrong’s famous footprints, to the lens of Emily’s camera. Autumn, and even winter, with their cool, clear night skies and haunting landscapes, are wonderful seasons to gaze at, ponder, appreciate, and fall in love by the sight and light of our nearest neighbor, the moon. (I know that last sentence was a very full one, but one inspired by an image of a very full Savannah moon.) Still, I highly recommend that the people of the earth give all of those things a try. Thanks for the photo, Em. “George’s World,” a new 740-page collection of George’s columns from The World, is available at xlibris.com, amazon.com, barnesandnoble.com and your favorite bookstore. “The Smoke And Mirrors Effect,” George’s first novel, can be seen at amazon.com and barnesandnoble.com. Happy Reading!